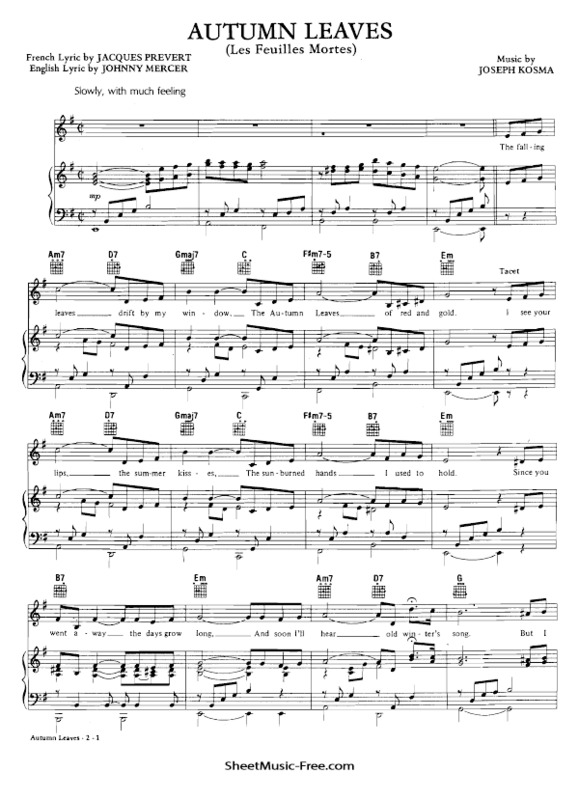 “Autumn Leaves Sheet Music” by Les Feuilles Mortes, “ Autumn Leaves Sheet Music” for Piano / Vocal/ Guitar Chords , Original key: E Minor, number of pages sheet music PDF: 2, Video and Lyrics song Autumn Leaves Sheet Music. “Autumn Leaves’” is a popular song. Originally it was a 1945 French song, “fr:Les feuilles mortes” (literally “The Dead Leaves”), with music by Hungarian-French composer Joseph Kosma and lyrics by poet Jacques Prévert. The Hungarian title is “Hulló levelek” (Falling Leaves). Yves Montand (with Irène Joachim) introduced “Les feuilles mortes” in the film Les Portes de la nuit (1946). Its iim7 – V7 – IMaj7 – IVMaj7 – ii7(b5) – V7 – im chord progression is an example of the circle-of-fifths progression. Autumn Leaves Sheet Music Les Feuilles Mortes.